Do you stand tall over them and look down? Or do you squat down and look them in the eye? The simple action of getting down on kid level will make for an even stronger connection in the conversation. Don’t worry if you can’t squat. There are lots of ways to get down to kid level! 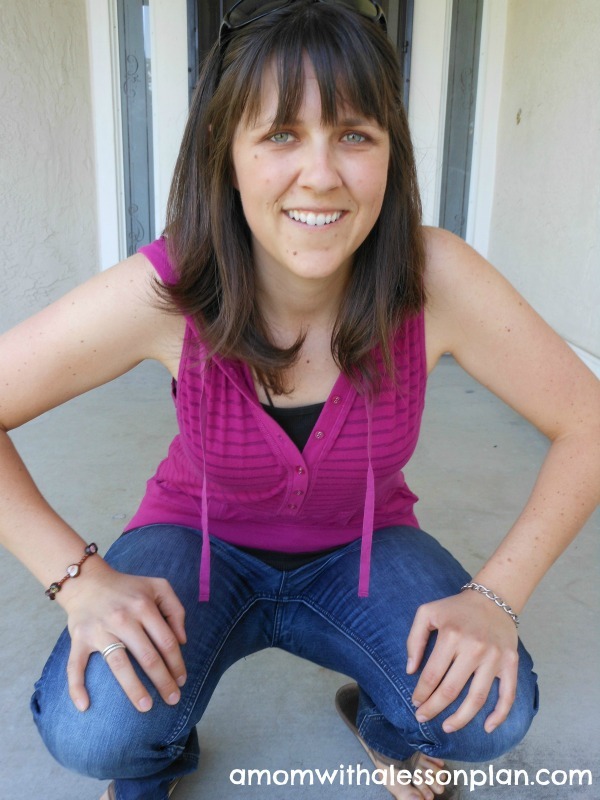 Sit on a chair, sit on the ground, squat or kneel down. Anything that brings you eye to eye. Look at Little M’s neck in this picture. She has to lean her head way back to talk to her Auntie L. Their faces are actually very far apart and eye contact is difficult. Can you imagine talking to everyone like this? When Auntie L squats down in front of her, Little M easily shares her story face to face. Getting down on kid level helps kids learn the important skill of eye contact while conversing. It also show’s that you are ready to give your full attention. Doesn’t that sound like a wonderful way to enter a conversation? 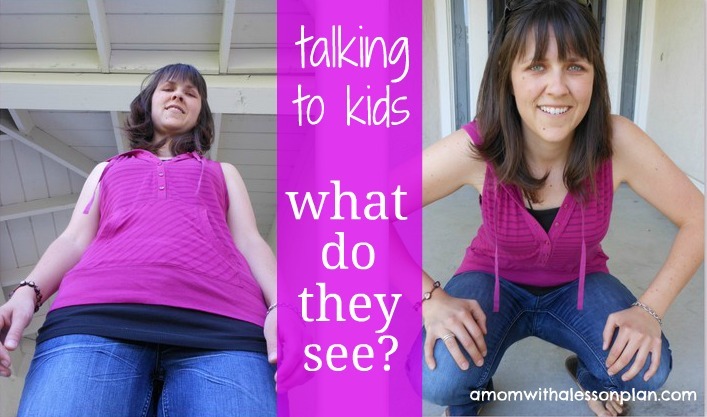 So I ask again, how do you position your body when talking to kids? Simple parenting tricks like this one can make all the difference when comes to really connecting with your kids. For specific answers to your parenting questions visit Ask Jill. And that’s why I decided to say YES! This post originally appeared on May 9, 2012. What a great post and a wonderful way to make it visual! One of my teaching mentors always said that working with children was great exercise because you have to do a lot of deep squats! Eye contact really is so critical. Thanks for pointing that out in such an effective way! Ha ha! When my son was little I joked with friends that they could just borrow him instead of joining a gym. Kids are a great workout! Great post! I have always done this, instinctively, even before I became a mom. I would always kneel/squat down with my nephew and niece when talking with them. It’s more pleasant for *me* to be able to look them in the face when interacting with them, let alone for them! I agree that it’s more pleasant for the adults as well as the kids. Nicely said! This is fantastic! Such a good reminder to all of us. Appreciate the way you illustrated this post. We don’t realize how we come off to children. By getting down to their level we show them just how valuable they are instead of towering over them to show them how “powerful” we are. Eye contact is so important. Love your visual. The other day we had friends over who are professional clowns. Well as you can imagine, they started entertaining our daughter (16 months old) and eventually a dance-off occured. When my daughter realized that our friends husband was towering over her and she had to look up, she started to point to the floor motioning him to go down. This is something we taught her to do with our dog. So I am thinking that in her little head she said, “This guy needs to come down to my level and dance with me.” I have been trying to use this tactic with her because she tends to respond better to me if she gets into things (kitchen cabinets, closets, etc. ) and she will stop. If I tower over her it’s seems as though I am talking to the wall and she continues. So I do have to remind myself to get down to her level. Good advice. What a lovely story! I love that you are teaching her to communicate what she wants. Did he come down to her level? I forgot to mention, that she kept pointing down and when I connected the dots, he did just that. He got down on his knees and kept dancing with her. It amazes me how parents have to decipher, translate, and interpret baby and body language (I am a new mom). This is fabulous! 🙂 I do get down on my daughter’s level most of the time and ask for her to have eye contact. This is a fabulous reminder of WHY it’s important to do so! 🙂 Thanks for a great post! Hi Jillian! That’s a good one. I, myself believe that the most important thing in a conversation is to maintain eye to eye contact. Practicing it with your children will teach them this valuable lesson; which is needed for rest of the life. Thank you Emily! I agree that eye contact is a life skill that everyone should learn. Great post, Jillian! I’ve tested this with kids of all ages, and it really does make a difference. Your photos illustrate the point perfectly. Thank you Rachelle! I agree kids (and adults) of all ages prefer to be looked in the eye. Such great advise! I’m a foster parent for kids in therapeutic care and over the years I’ve had a few younger boys with Aspergers Syndrome and one of the symptoms is avoidance of eye contact so this is even more important when talking to these little ones as they need much more support with this issue. Thank you. Good point that every kid will benefit from this tip, but some kids need it more than others. So true! Great post! It’s amazing that such simple things can make such a big difference. Thank you for putting this out there! It drives me crazy when I see parents reprimanding their children like a tyrant, hover above. Me too! Although I think some people just don’t know how it looks to the kids. This is such a great visual way to remind us all to get down on the kids level! It’s a repeated theme in many language intervention programs, but this illustrates it so well!! Thanks so much for sharing it. Thank you Emily! I really appreciate the compliment. Wow! Thanks for those photos. I think we have all heard this advice, but when you see it, it is so clear why it is a good parenting practice! Great reminder. 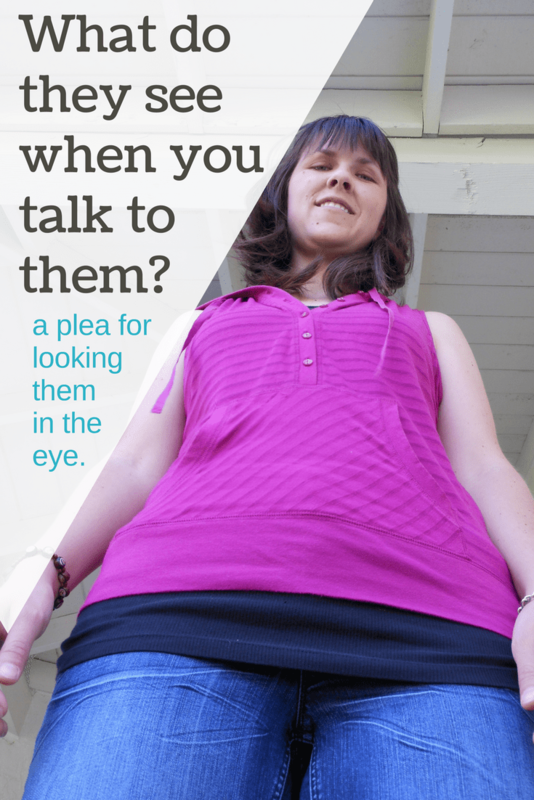 Especially since I’ve been trying to teach my children to use eye contact while talking to people. Thanks! Of course, and wonderful visuals. When they get to be teens however, the opposite is true… a ride in the car is effective because there is so little eye contact! The visual image on this really grabbed my attention when I saw it on Pinterest just now. 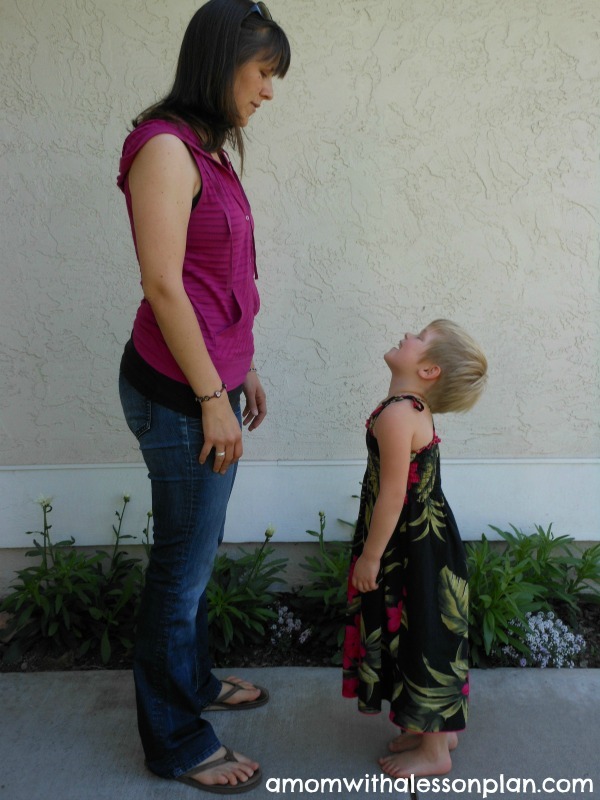 It’s a real eye opener to how our kids have to (literally) look up to adults. How nice for them when we get down to their level 🙂 I’ll share this great post on my FB page for Project Me for Busy Mothers. Thank you! Oh, that makes sense… I’ll think of that more often. Thank you!